Home air conditioning systems come in several types, ranging from large central systems driven by outdoor compressors to small plug-in units that stand on the floor or mount in a window. No matter what form they take, air conditioning systems have similar working components, including a refrigerant, a compressor, a condenser, an expansion valve, and an evaporator coil. All of these work together to transfer heat and moisture from the inside of your home to the outside. A window air conditioner is technically called a "unitary" air conditioning system and consists of a self-contained air conditioning unit that is placed in a window or, less commonly, through a hole in an exterior wall. A window air conditioner contains all the refrigeration components in one compact box. It ejects heat out of its outdoor side and blows cooled air into the room on the indoor side. Window air conditioners come in many sizes to cool any space from a single room up to an entire floor. Even a small home may be adequately cooled by a large window air conditioner, especially if it's a single-story home. This system is another version of a unitary air conditioning system. The portable air conditioner consists of a mobile, self-contained air conditioning unit that is placed on the floor inside a room and discharges exhaust heat using a hose vent through an exterior wall or window vent. 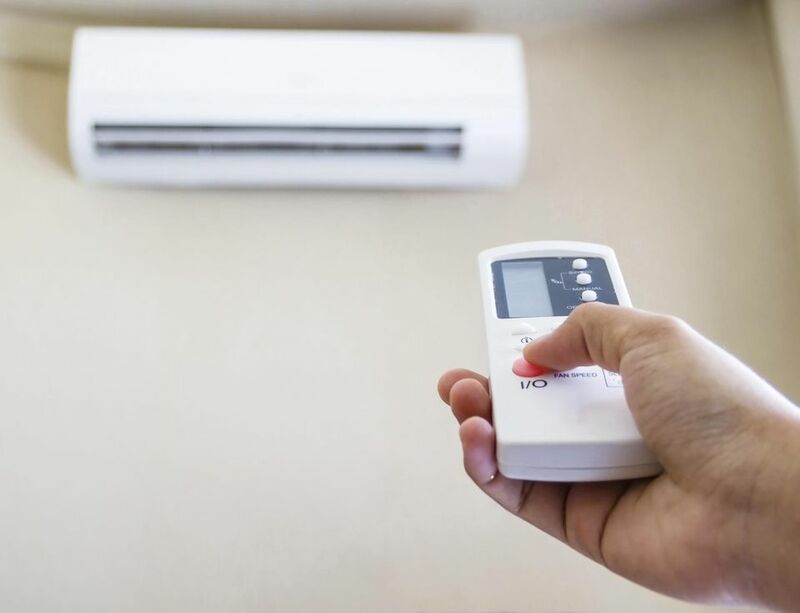 Portable air conditioning units are a bit noisier than other types of AC systems and are typically suitable for room sizes under 500 square feet. Many people use portable air conditioners for temporary space cooling or wherever it's not practical to install a window-mounted unit. Like the window air conditioner, the portable unitary system has all the refrigeration components in one compact box. Because the portable unit sits indoors, its evaporator fan runs fairly constantly in order to evaporate the condensed moisture that collects within the unit. This is quite different from a window-mounted unit, where condensed moisture simply drips onto the ground. The split system, also called ductless or "mini-split," is commonly found in homes as well as hotels and other multi-unit buildings. It has become an increasingly popular option for homes that are not served by a forced-air HVAC system, such as those with hot-water (hydronic) heating or electric heating. Most split air conditioners are also heat pumps and offer heating as well as cooling functions. The split system breaks the air conditioning system into two packages, or terminal units: The condensing unit is located on the building's exterior and includes the compressor, condenser, and condenser fan. The evaporative unit is located on the interior and handles the air cooling and distribution. This is usually a rectangular box unit mounted high on an interior wall and contains a circulation fan, expansion valve, and evaporator coil. Refrigerant tubing passes through the wall between the condensing and evaporative units. A central air conditioning system is the largest type of conventional air conditioner. Like a split system, a central system is made up of two units—the condensing unit and the evaporative unit— that are connected to each other by refrigerant tubing. The condensing unit is a large, boxy outdoor unit that contains the compressor, condensing coils, and condensing fan. The evaporative unit typically sits in the plenum (the large central chamber between the furnace and the duct system) of your furnace. This means the air conditioning uses the same ductwork and blower fan as your heating system. Within the plenum, the evaporative unit consists of the evaporator coil and expansion valve. Central air conditioners are typically the most effective type of air conditioner for cooling entire homes. When installing a new central system, the primary consideration is making sure the system is sized appropriately for your home. If a system is too large, it will not perform well and will not adequately dehumidify the interior air. If it's too small, it will not cool adequately. Proper maintenance of a central air conditioning system is also very important.